Tidy your garden the easy way with a powerful, lightweight trimmer that features dual action blades, large cutting diameter and safe, two-handed switching. Treat your garden to a trim using the Black & Decker 420 Watt Hedge Trimmer. This powerful tool is lightweight with a balanced design and dual action blades for quick and easy trimming. 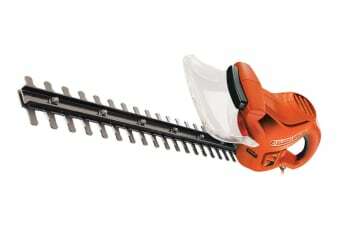 Its 16mm cutting capacity allows you to take on most trimming jobs around the home. For your safety, the dual switching feature means that both hands have to be on the handles for the unit to work, while the clear guard protects your hands from being cut by branches as they are trimmed.